Love in all its forms gets the once-over in this collection of New Jersey Dominican voices, linked by Yunior, the lesson-learning character at its heart, who is destined to have the ‘footprint of fresh disaster’ on his soul. The precarious wit of the love-struck, the inevitable mourning of the sexual chancer, the bitter lack of expectation of the mistress – all are laid bare with details that hide a story in each small shell of a sentence. A sense of menacing disappointment travels with the couple on a make-or-break holiday to Santo Domenico; on the one hand she is too sensitive – ‘takes to hurt the way water takes to paper’ – but she has also been dressing better and going out, after discovering the games he was playing. ‘Making me aware of my precarious position in her life,’ is how Yunior sees it. In ‘Nilda’, a 14-year-old recalls a raft of his brother’s girlfriends – ‘I don’t remember her name, but I do remember how her perm shone in the glow of our night-light’ – in a piece that resonates with the fleeting possibilities of adolescence, how fresh they seem until you look back. In ‘Alma’, the cheater’s moment of discovery is described with the mournful wit of a man accepting the inevitable – ‘your heart plunges through you like a fat bandit through a hangman’s trap’. In ’Invierno’, Yunior – with a brother who wants to be buried in his car with his TV and boxing gloves – relates his childhood with a mother keen her two sons learn English. ‘She saw our young minds as bright, spiky sunflowers in need of light, and arranged us as close to the TV as possible to maximize our exposure.’ In their new home – away from Santo Domenico – the brothers ‘squirted acid at each other with eyes, like reptiles’ as their mother – ‘with a tight, guarded smile that seemed to drift across the room the way a shadow drifts slowly across a wall’ – dances attendance on her husband and his infrequent dinner guests . All love’s voices are here – the pitiful, crestfallen, the older mistress, Miss Lora – ‘the black waves of her hair flowing behind her like a school of eel’ in the swimming pool – tapping an upbeat rhythm to determinedly cheerful hopelessness, and the man at the heart of it keeping an attitude going because what else do you do? 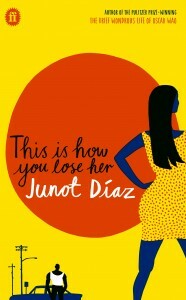 Over the last 16 years, Yunior has been an integral character for Diaz, and the author describes This is How You Lose Her as ‘one cheater’s tortured journey through to real heartbreak, a crisis from which he emerges, if not necessarily cured, at least closer to possessing something we could call an authentic human self’. I raced through these stories, longing to start back all over again, not wanting the relationship to end. This is, no doubt about it, how it should be done.